Revenue in the Vehicle Services segment amounts to US$481m in 2019. Revenue is expected to show an annual growth rate (CAGR 2019-2023) of 14.5%, resulting in a market volume of US$827m by 2023. The Vehicle Services penetration is 2.8% in 2019 and is expected to hit 5.3% by 2023. The market's largest segment is Remote Services with a market volume of US$246m in 2019. In global comparison, most revenue is generated in United States (US$481m in 2019). Not included are road map updates of the navigation system. Those can be found in the Infotainment Services segment. Reading Support Revenue in the Vehicle Services segment amounts to US$481m in 2019. Reading Support The Vehicle Services segment is expected to show a revenue growth of 20.0% in 2020. 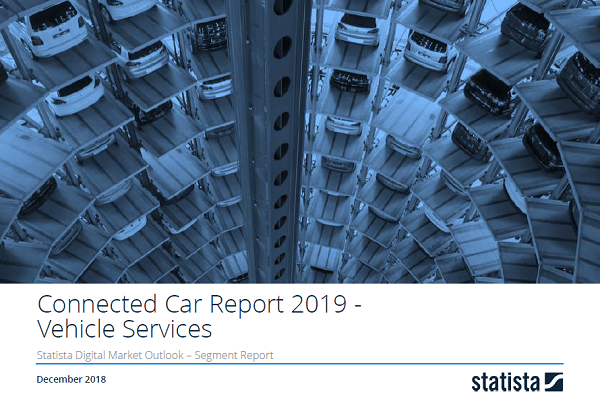 Reading Support In the Vehicle Services segment, the number of Connected Cars is expected to amount to 6.9m by 2023. Reading Support Penetration in the Vehicle Services segment is at 2.8% in 2019. The “Stock of Connected Cars” box shows the number of existing Connected Cars of the selected market (market segment, region) in millions for each year. The “Penetration Rate” box shows the share of Connected Cars from the total number of households of the selected market (market segment, region) for each year. Reading Support The average revenue per Connected Car in the Vehicle Services amounts to US$54.72 in 2019. The box shows the average annual revenue per Connected Car of the selected market (market segment, region) for each year. Reading Support With a market volume of US$481m in 2019, most revenue is generated in United States. Here you can find more studies and statistics about "Vehicle Services".